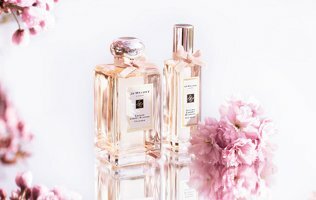 Jo Malone will launch Sakura Cherry Blossom, a new limited edition fragrance for women, in March. Sakura Cherry Blossom was developed by perfumer Christine Nagel, and celebrates the time "when the cherry tree is in full bloom against the spring sky". ...an exquisite interpretation of cherry blossom, bringing it to life with layers of rose, and mimosa accented with the freshness of bergamot and mandarin. The result is a powdery fragrance, contrasted by a base of musk and woods. If not too sweet…that’s my complaint about most Sakura scents, they smell like cherry jam. Maybe! This one might be Asia-only, so perhaps I ‘ll never know. Sounds now like it will launch in the west, but not until May. So you must tell us what it’s like! Rose, mimosa, and powdery sound good to me. I’ve been very disappointed with other attempts out there at a “cherry blossom” fragrance. Really, the blossoms have no scent at all, and what they come up with usually smells more like cherry cough syrup. Here’s hoping – I look forward to a test! Some cherry blossoms do have scent — but yes, most cherry blossom perfumes smell like cherries, not cherry blossoms. I often wondered that. Thanks for the clarification since everything I’ve smelt with cherry blossoms smells nothing like cherry and now I know why. You know, powdery fragrances can be a hit or miss with me. It depends on how powdery it is. What exactly does mimosa smell like? I wore a perfume with mimosa in it the other day, and it smelled kinda weird, like an orange creamsicle. Is that the mimosa? Gees, Nagel’s been busy. I’ve been wearing ICONOfly’s Attache-Moi the past week (quite good, by the way), which was composed by Nagel and Lapouza. And now there are all these Jo Malone releases with her name attached. One wonders whether her gift for production can be that prolific. Perhaps, with ample staff and facilities, it’s not so difficult to develop numerous creations in a short span. This sounds quite nice to me – Jo Malone always has very pretty limited edition scents so I look forward to this one. I’d love a cherry blossom fragrance that didn’t remind me of cough syrup. I have been looking forward to this new fragrance for a while (I love Sakura and Japanese culture), and finally I went to the store and had a sniff on paper today. It is lovely – light, floral, feminine, clean. But it somehow reminds me of Dior’s Miss Dior Cherie Blooming Bouquet, which I already have. I’ve recently become obsessed with researching the Jo Malone scents. I’m going to test them when my Nordstrom gets the A*Men Pure Havane in stock so I don’t make two trips :). From the two trials, I can say that the scent is pretty but not that unique. I can’t exactly name the fragrance but I think I’ve smelled it elsewhere.